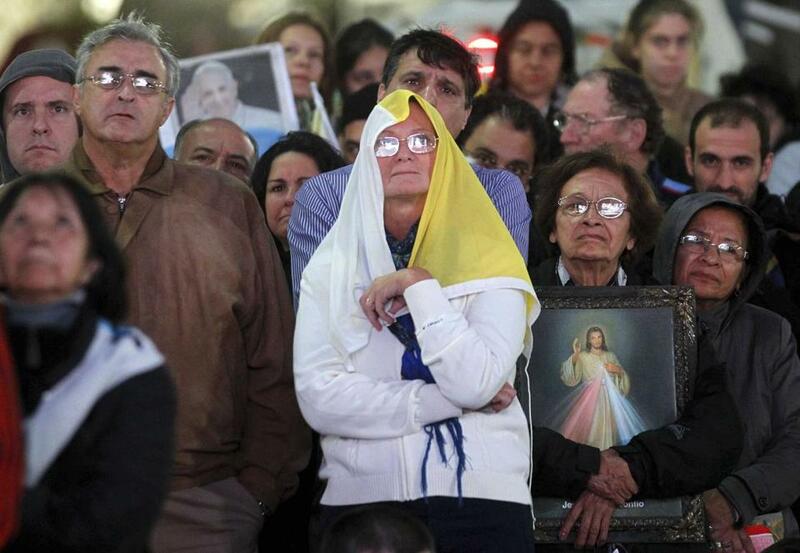 A crowd near the Metropolitan Cathedral in Buenos Aires watched Pope Francis celebrate his inaugural Mass. VATICAN CITY — At the formal start of his papacy, Pope Francis offered a passionate pledge Tuesday to serve ‘‘the poorest, the weakest, the least important,’’ striking the same tones of humility that have marked the days since he was elected last week. “Today, too, amid so much darkness, we need to see the light of hope and to be men and women who bring hope to others,’’ he added to frequent applause from some among the tens of thousands of people cramming the square and the broad avenue leading to it from the River Tiber. The Vatican estimated the number at 150,000 to 200,000. His words, for some, found an echo. “This is why we are all here, his warmth,’’ said Andreina Baldi, 58, a housewife from Rome, at the end of Francis’s homily. “He just said that we should all open our arms to welcome God’s people, anybody, the poor, the youngest, those in jail. And he is already doing so. He wouldn’t stop kissing a baby in his tour on the pope-mobile earlier, right here, in front of me,’’ she said. Francis, 76, was elected last Wednesday as the 266th pontiff of the Roman Catholic Church to replace the far more formal and reserved Benedict XVI, 85, the first pope in 600 years to resign. 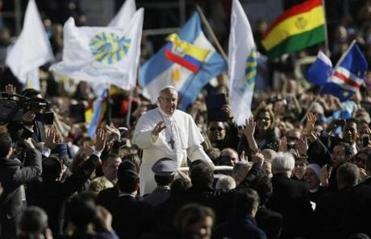 Francis is the first Jesuit pope and the first pope from Latin America. But the main clue to his likely approach to a troubled office beset by scandals over governance, sexual abuse, and financial mismanagement lay in his decision to take his papal name from St. Francis of Assisi, who embraced the poor. Until last Wednesday he was Cardinal Jorge Mario Bergoglio of Buenos Aires. The installation Mass on Tuesday, before crowds of well-wishers, pilgrims, and sightseers, drew heads of state from his native Argentina to Zimbabwe. For most of those assembled in St. Peter’s Square, the first glimpse of Francis on Tuesday came when he arrived among them below the soaring facade of St. Peter’s, standing in the rear of a white open-air vehicle rather than a covered version of the traditional pope-mobile protected by bulletproof glass. He wore simple white robes, halted to kiss a baby in the crowd, and walked among the faithful. At one point, he gave supporters a thumbs-up sign, drawing laughter. He stopped to kiss a disabled man on the forehead, and people in the square said he seemed relaxed. Security officers flanked his vehicle and a strong contingent of Italian police mingled with the crowd around Francis, who is the son of Italian immigrants. Earlier, Francis entered St. Peter’s Basilica to prepare for the two-hour installation Mass in the square outside, praying at the tomb of St. Peter flanked by prelates of the Eastern churches and then walking along the vast marble interior to appear again before the throngs waiting for the service. Offering a clear signal of his own ambitions for his papacy, Francis asked: ‘‘How does Joseph exercise his role as protector? Discreetly, humbly, and silently, but with an unfailing presence and utter fidelity, even when he finds it hard to understand,’’ the pope said.